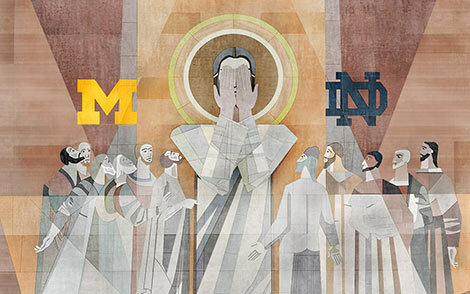 Notre Dame week wallpaper does not disappoint. Since knocking off then No. 2 Notre Dame on Sept. 16, 2006, the Wolverines have gone 0-7 against Top 25 teams in true road environments. Michael Rothstein takes a comprehensive look back at the first night game in Michigan football history. Al Borges, Michigan offensive coordinator: Coaching in a lot of the stadiums in the SEC, a lot at night, there are some I remember well, the LSU and Florida games, and boy, it was rocking. But I don't remember any of them being as electric, 100,000-some pom-poms and the chants. Even in the press box, as focused as we are as coaches, you can't help but hear the house rock. In Kirk's defense, you don't have to be too old to understand it. No one understands it. Apparel companies and suppliers love it...it sells more jerseys. Just go with it. "If I understood, I would probably be younger," Iowa's head coach said Tuesday when asked a question about Iowa's alternate uniforms. "I just know they do. It's almost unanimous I think they do. That's the world we live in." "If we wore a different uniform every week, I think that would probably enhance our image with some players," Ferentz said. "So things like that are things I'm not good at seeing. I need people to help me with that because I have a blind spot there." John L. has always been a reporters/bloggers best friend, but...I mean, whoa. Hope for Pahokee reached it's $35,000 goal with about a week left until their deadline! Bravo to Martavious Odoms for putting together this organization and doing the work he's doing. Michigan 2013 5-star QB commit Shane Morris might miss the rest of his senior season with mono. Shutdown Fullback snarks the hell out of week 4. Crisler Arena has a new floor. Pieces of the old one, which has been used since 1967, was turned into medallions for the men's and women's locker rooms. Remind me to stay away from Houston Texans' LB Brian Cushing.